The US Green Building Council’s South Florida Chapter Emerging Professionals will be participating in this Friday’s “Park(ing) Day,” a worldwide event that inspires city dwellers everywhere to transform metered parking spots into temporary parks. Started in 2005, Park(ing) Day is a way to draw attention to the need for more public parks in urban areas. This year’s local event is scheduled to take place between 10:00 a.m. to 2:00 p.m. along McFarlane Road in Coconut Grove. Donations and support will be provided by Pie Studio, Home Depot, AFH, the City of Miami, Coconut Grove community organizers, the NET, the BID and the Miami Parking Authority. The MPA has designated 10 metered parking spaces along McFarlane Road which will be transformed into temporary urban parks for the day. Commissioners Sarnoff and Suarez are scheduled to appear, and the public is invited to attend. With S.E.A. as part of your project team, spaces will be better, healthier and have economic saving, in energy, water, and resources, which also reduce the burden on this planet. 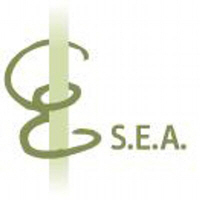 S.E.A. helps to set yourself apart as a leader in your community and to know that you are doing the right thing! Eurohabitat “Living Tetris” project has gone through some changes since its first submittal for permit and is ready to move forward. The now smaller house still features cutting edge design including a unique custom pool and native as well as regionally appropriate landscaping designed by Southern Blossoms. Some of the more hidden features include a manifold plumbing system, high efficient water fixtures and appliances and LED lighting. The house is PV ready. The team and the Village are excited to see the first LEED certified home for the Village of Pinecrest start construction soon. 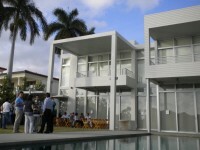 Nearing construction completion is the Glantz remodel at The Balmoral in Bal Harbour. The renovation of a spectacular corner unit added a bedroom and updated the kitchen and master suite. Lookout for a picture of the month from this amazing project in a future newsletter. 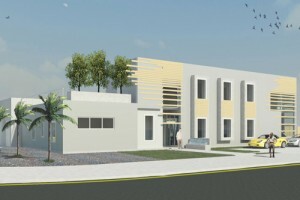 The GSA Trades Shop Facility, the first LEED Silver certified project for Miami Dade County. We are eagerly awaiting comments from the USGBC. Design on the Pinecrest Gardens lower Bathroom project has been completed and SEA has moved to the construction document phase detailing the structure and the water filter system that will be installed instead of traditional sewer system. SEA is proud to team up with New Orleans based FuturProof. 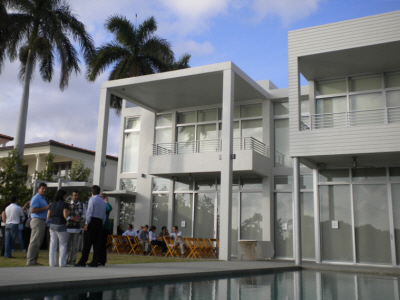 The LEED H M+M LEED Homes residence by Upstairs Studio in Coconut Grove has been awarded the AIA award and is already a Energy Star home. The LEED certification is eagerly awaited by the team.